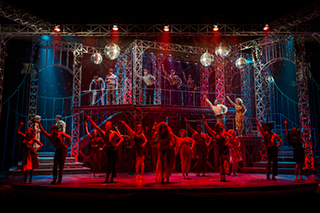 The world premiere of the first North American production of “Saturday Night Fever” just opened at the Finger Lakes Musical Theatre Festival, and we’re loving the bell bottoms, disco music, and funky lingo! We thought it would be interesting to highlight some 70s takes on music, fashion, and dance moves. An instant classic, the story of “Saturday Night Fever” is the perfect snapshot of that landmark decade. First, one of the markers of “Saturday Night Fever,” and what nearly everyone thinks about when they hear the name, is the music. The soundtrack was primarily made up of songs from the Bee Gees, whose popularity as disco stars practically ensured the film’s success. In fact, the title of the film was influenced by one of the Bee Gee’s songs. The film’s working title was actually just “Saturday Night,” but instead of writing a new song, the musical group suggested using an already written number called “Night Fever” and changing the film title. The soundtrack was a never-ending series of hits (some of which had already been released and were number one hits before being in the movie), and that popularity resulted in the movie soundtrack winning a Grammy Award for Album of the Year, making Grammy history. Adding to the nostalgia and memories brought back by the music, is the visual aspect of “Saturday Night Fever.” Ranging from flowing skirts and tie-dye to tight spandex and neon, the fashion in the 70s had many different aspects. Even for just the disco scene, there were a huge number of variations, with no set “outfit.” Platform shoes and bell bottoms were an option, but so were corduroy pants and jumpsuits. This represents the 70s well, when experimentation and creative expression was the name of the game. Finally, the DANCING! The whole reason for the music and flashy outfits was to hit the dance floor and forget reality for a few blissful hours. If the 60s were about peace and love, then the 70s themes would be rebellion, self-confidence, and the search for happiness. For a time, the disco DJ’s ruled music, and if they played your songs, then you were sure to have a hit. Some bands calculated this, and by crafting hits that got people on the dance floor, scored needed record deals. Most dances in the disco phase were partner dances, but after the movie “Saturday Night Fever” came out featuring John Travolta’s solo dances, the last few years of disco were filled with individuals doing their own moves. Classic dances and moves like the “Hustle,” “The Bus Stop,” and “YMCA” rule dance floors even today, with infinite variations. Even though the disco scene has faded, influences from the 70s linger. However, even if we took away the music, outfits, and dancing, Tony Manero’s story of feeling stuck in a pre-determined set of circumstances and trying to break free still resonates with a global audience. What ensures the popularity of “Saturday Night Fever” is not only the time machine effect of traveling back to a landmark decade, but the truly timeless story.